Scott P. Steinmann, MD received his undergraduate degree from Columbia University and his MD degree from Cornell University. He completed an orthopedic residency at New York Orthopedic Hospital, followed by a shoulder fellowship at Columbia and a hand fellowship at Mayo Clinic. 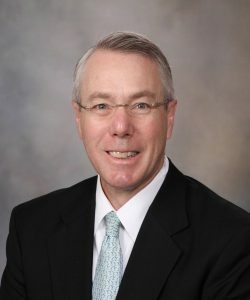 He is a member of the American Shoulder and Elbow Surgeons, the American Society for Surgery of the Hand, the Arthroscopy Association of North American, the American Academy of Orthopedic Surgeons, the American Association for Hand Surgery, the International Society of Arthroscopy, Knee Surgery and Orthopaedic Sports Medicine, and the Minnesota Orthopedic Society. Dr. Steinmann has participated in numerous meetings as course chair, faculty, and moderator. He also continues to be active as a scientific reviewer and editor of various journals. Dr. Steinmann holds the position of Professor of Orthopedics at Mayo Clinic in Rochester, Minnesota, and is a member of various committees at Mayo Clinic regarding research, focusing on elbow and shoulder surgery.